There are many fun facts about Italy, plenty of curiosities about Italian people, Italian products and Italy itself. 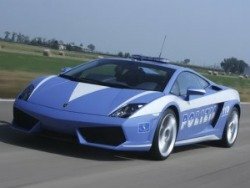 1) On Italian roads you can see very fast Policemen on board of Lamborghini Gallardos. 2) America was named after the Italian cartographer and explorer Amerigo Vespucci (Florence 1454-1512): Amerigo -> Americo -> Americ ->"Land of Americ"-> America. Ferrari, Lamborghini, Maserati, Alfa Romeo, Lancia, Fiat. 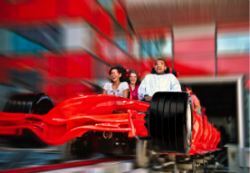 4) Ferrari World in Abu Dhabi, a Theme Park dedicated to this prestigious Italian car company is the first of its kind in the world. 5) The Lottery was invented by Benedetto Gentile in 1576 in Genoa (IT: Genova). 6) The famous astronomer and mathematician Galileo Galilei was born in Pisa in the year 1564. He invented the first atmospheric thermometer. 7) Genoa is also the invention home of denim jeans (sec.XVI): the name blue jeans is coming from french term "bleu-de-Gênes" (literally: blue-of-Genoa); Genoa -> Gênes-> Jeans. 8) The drive shaft with universal joints or cardan shaft, the project of cardanic transmission, was invented by Girolamo Cardano (Pavia 1501-1576). 9) Monte dei Paschi di Siena, the world's oldest bank, was founded in the year 1472 in Siena, Tuscany. 10) In the town of Syracuse, Sicily, was born the famous mathematician Archimedes in the year 287 BC and died in 212 BC. 11) Carlo Collodi, born in Florence, was the writer of "Pinocchio" (1826-1890). 12) The famous Renaissance sculptor, painter, scientist, engineer and architect Leonardo da Vinci was born in Tuscany in the year 1452 and died in 1519. 13) New Zealand is the second world's largest kiwifruit producer, after Italy. 14) Marco Polo (Venice 1254-1324), Giovanni Caboto (John Cabot, Gaeta 1450-1498), Cristoforo Colombo (Christopher Columbus, Genoa 1451-1506), Amerigo Vespucci (Florence 1454-1512), were all Italian explorers. 15) Alessandro Volta, born in Como in 1745, studying electrical energy, invented the battery. The term "Volts" was originated from his last name. 16) A prototype of the telephone was invented in 1844 by Innocenzo Manzetti. 17) Antonio Meucci was born in Florence (1808) and died in Staten Island (1889). He invented the telephone, filed a caveat (temporary patend) in 1871 to 1874. Alexander Graham Bell patented it in 1876, and finally (on June 11th 2002!) the U.S. Congress tributed the invention to Meucci. "Whereas if Meucci had been able to pay the $10 fee to maintain the caveat after 1874, no patent could have been issued to Bell: Now, therefore, be it Resolved, That it is the sense of the House of Representatives that the life and achievements of Antonio Meucci should be recognized, and his work in the invention of the telephone should be acknowledged". 18) The Pizza is an Italian invention and came originally from Naples. 19) In 1808 Pellegrino Turri invented the typewriter. 20) Italy is the country that produces the largest amount of pasta in the world: 3,2 million metric tons (3,15 million Long ton) - another of the fun facts about Italy. 21) Every Italian is consuming 28 kg (62 lb) of Pasta a year. 22) Evangelista Torricelli, who invented the Barometer, was born in Faenza (1608), died in Florence (1647). 23) The painter Michelangelo Buonarroti, Vatican's Sistine Chapel author, also architect and sculptor, was born in Caprese Michelangelo in 1475 and died in Rome in 1564. 24) The wireless telegraph was invented by Nobel Prize (1909) Guglielmo Marconi who was born in Bologna (1874) and died in Rome (1937). 25) Only in Italy you can find 2 more countries: Republic of San Marino (the oldest republic in the world) and Vatican City. 26) The Italian luthier Antonio Stradivari, famous in the world for his priceless violins was born in Cremona 1644 and died in 1737. 27) William Shakespeare's drama "Romeo and Juliet" was taking place in Verona Italy. 28) The metal studs were invented by the ancient Romans. 29) Anesthetization was invented in Italy by Ugo da Lucca in the year 1200. 30) The ambulance (horse-drawn) is an Italian invention (year 1244). 31) Eyeglasses were invented in Italy (about 1300). 32) The first home fireplaces were built in Venice (1347). 33) The spring-wound clock was invented by Filippo Brunelleschi (1410). 34) The Neapolitan coffee maker was invented in Naples in 1691. 35) The electric clock was invented in 1812-1831 by Giuseppe Zamboni from Verona. 36) Federico Faggin, born Dec 1, 1941, from Vicenza is the inventor of CPU microchips (Intel 4004, 8080 and 8088), a revolution in computer technology.